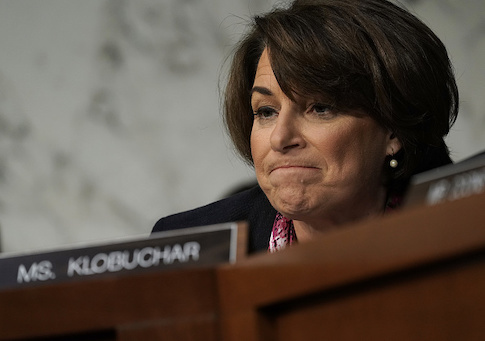 The Washington Post fact checker gave Sen. Amy Klobuchar (D., Minn.) four Pinocchios for citing bad data in an attempt to claim credit for reducing black incarceration while she was the top prosecutor in Hennepin County, Minn.
Klobuchar claimed "there was a 65 percent decrease in incarceration of African Americans when you go from the beginning of my term to the end" during an appearance on CNN's State of the Union on Sunday. Her staff later clarified she was speaking about the jail population, rather than prisons, in Hennepin County, and cited a database from the Vera Institute of Justice which shows "a 65 percent decrease in African Americans held from 1999 to 2006, compared with a 13 percent decrease in prisons." The data from the Vera Institute show most of the decline in jail incarcerations took place between 2000 and 2001, the Post reported. Furthermore, this drop was reflected in statewide figures. The raw numbers, however, showed the jail population "did not change much from 2000 to 2001," and "whereas the five racial categories added up to 84 percent of the total jail population in 2000, they added up to just 46 percent of the population in 2001." "I dug into the source data," Vera Institute senior data scientist Oliver Hinds told the Post. "It seems that starting in 2001, Hennepin reported to the DOJ that about half of the people in their jail were of unknown race. This was not the case in 2000. This creates a false perception that both the number of white people and black people in the jail fell dramatically, while the total number of people in jail did not change very much. The 2006 data has the same issue." "This situation means that no meaningful statements about the number of black people in jail in Hennepin County can be made for the time Klobuchar was DA," Hinds continued. As for prisons, the Post found that "the overall rate of prison admissions from Hennepin County to the state prison system was 168 people per 100,000 residents between the ages of 15 and 64" in 1999, and was 169 people per 100,000 residents in 2006, Klobuchar's last full year in office. The Post notes that "the rate at which African Americans were admitted to the state prison system from Hennepin County decreased approximately 28 percent." Nevertheless, "African American prison admission rates were still 22 times higher than white prison admission rates in 2006." "The prison admission rate for African Americans did drop during [Klobuchar's] tenure, though how much credit she can claim is subject to dispute. The racial disparities remained huge. We wavered between Three and Four Pinocchios but ultimately tipped toward Four. On national television, Klobuchar claimed a figure that should have been unbelievable to herself," the Post concludes. This entry was posted in Politics and tagged 2020 Election, Amy Klobuchar. Bookmark the permalink.